Last year, hubby and I were at the National Museum of American Indian and stumbled across a delightful little exhibit on decorated skulls for All Souls’ Day. I am fascinated by this holiday, and the crazy cool decorations that abound. I wanted to try my own hand at a little craft to celebrate this holiday, and had a few extra supplies on hand to create a little something. 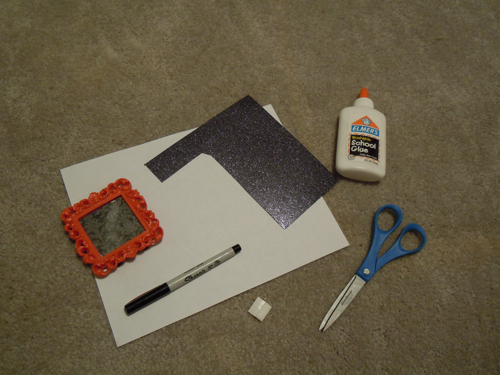 I bought a little $1 frame at Michael’s last year, took some leftover glitter paper (from my mini glitter tealight houses), some scrap white paper, a sharpie, glue, scissors, and small foam squares. First, I detached the plastic film covering the opening of the frame and took the paper insert out. 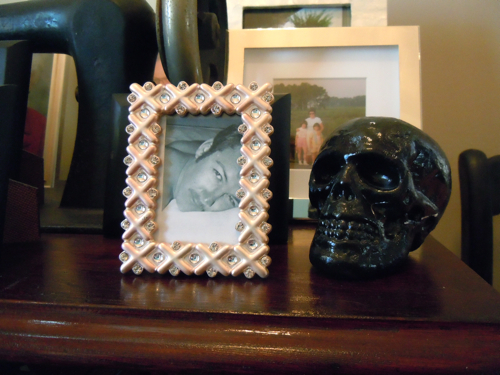 I cut a piece of glitter paper to fit, and inserted it into the frame. 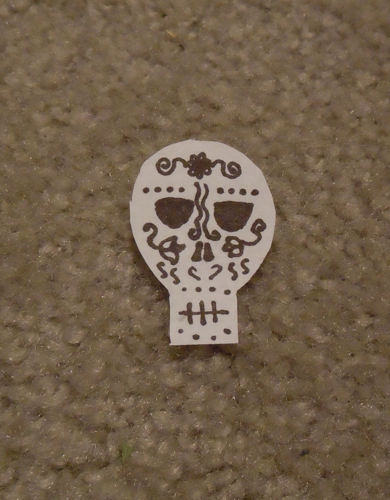 Next, I cut out a skull head, and decorated it with my sharpie pen. The shape is easy enough- a circle with a smaller square on one end. For inspiration for the skull, I looked online at All Souls Day decorations. (Skull candy is a good term to search). 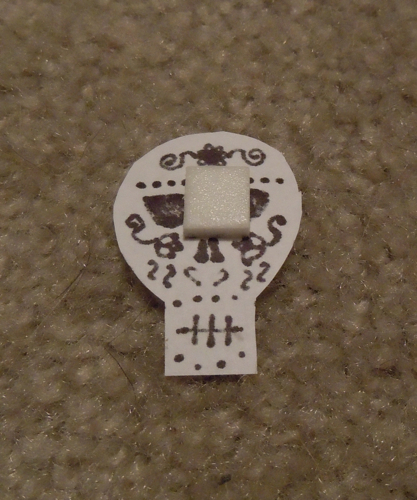 And finally, just glue the little foam square to the back of the skull and then to glitter paper. And voila! 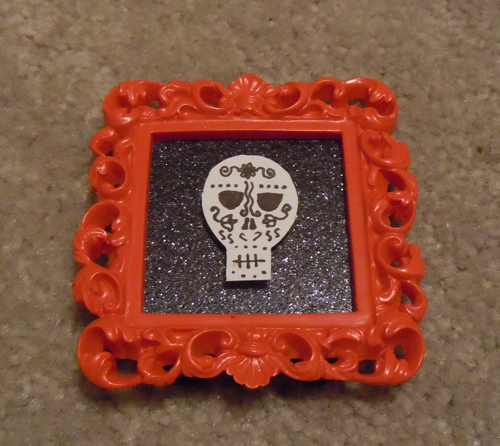 Your own little shrine to the dead. 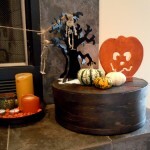 The rest of this post I wanted to show a few more pics of things I’ve been doing for Halloween decorations this year. 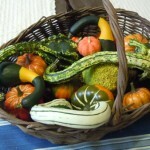 These are some more of the crazy gourds I bought at Miller Farms this year. 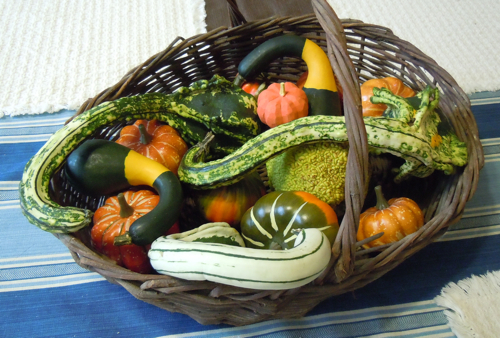 For filler, there’s an osage orange, and some mini fake pumpkins. 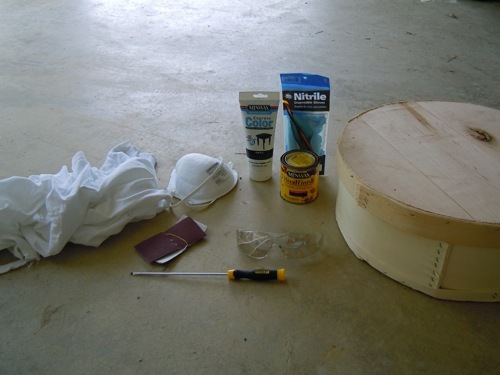 Here is what I settled on for a vignette on the Larkin chest. 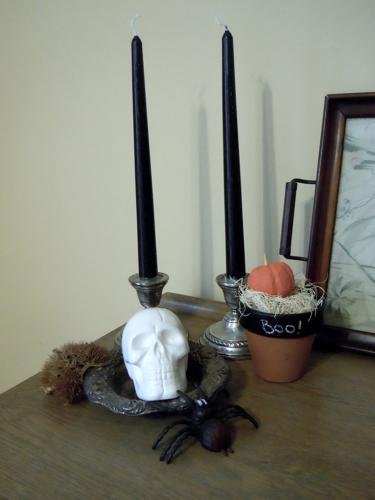 One of my smaller chalkboard painted planters, a ceramic skull in an old silver jewelry dish, a fake spider, and a pair of silver candlesticks with black tapers. Last year, I spray painted this foam skull black. I was thinking about making it a glitter skull, but I liked it plain. 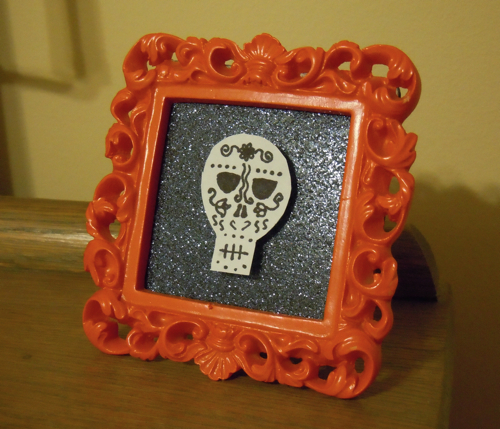 Another project I have in mind is to use a white paint pen and decorate it in a Mexican All Souls Day fashion. Right now he’s just hanging out on the sewing table in the front foyer. 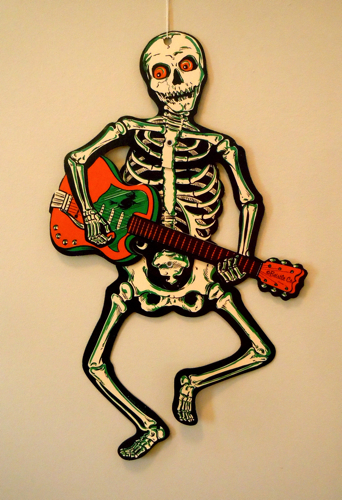 Also hanging out in the foyer is this Rockin’ skeleton. I picked him up a few years ago in a shop downtown, Walker Home Furnishings. Unfortunately (for me), they moved their store up to Arlington. But they always had lots of fun and cool antique Chinese furniture and modern ware. Below the skeleton I threw together this old plastic cauldron with some fake spider web material in it, and topped it with a bow. The whispy material of the webby stuff sort of looks like fake fog bubbling up. I bet at night, with a few tea lights inside, it could look more realistic and spooky! 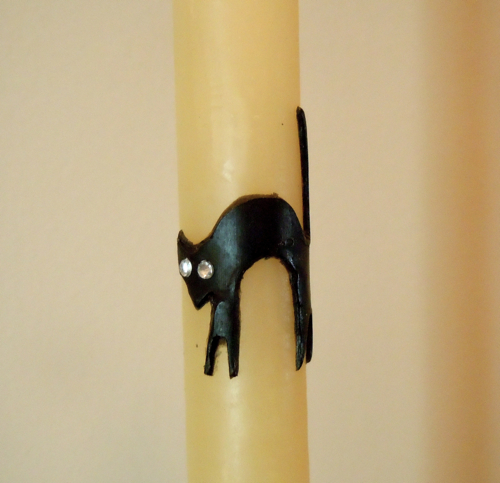 I love putting these candlesticks out every year. They have these black cats all over them with rhinestone eyes. Another (after Halloween on sale) purchase in downtown Fredericksburg. 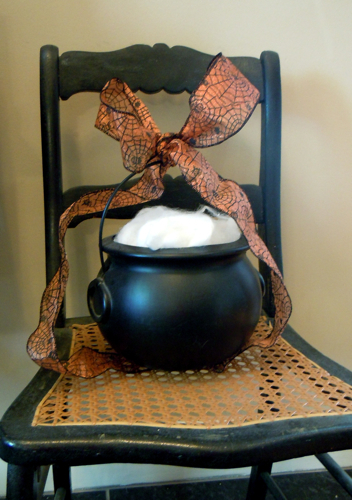 Happy Halloween and All Souls Day! It has been a while since I’ve posted anything. I’ve started a bunch of projects, but have stalled on a lot of them. In some cases, it’s just a matter of getting my wits about me to finish them. In other cases, I’m either missing materials or am unsure of what I want to do. 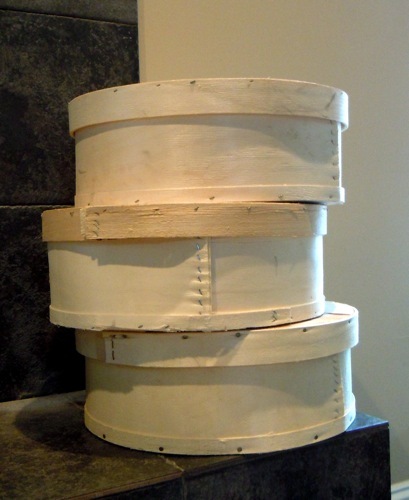 One project I have been able to finish is staining one of the cheese boxes I bought. 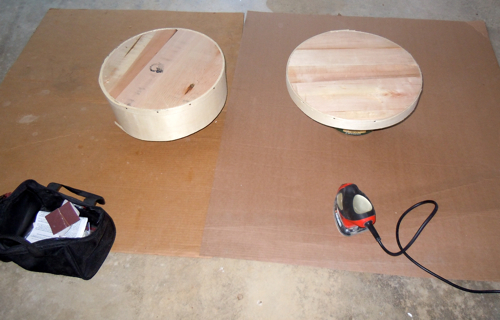 I experimented with the bottom first, with a black minwax all-in-one stain. It was super easy to use, however, you really need to use a brush to get in the little crevices. Also, it was just too dark, opaque, and not what I wanted. I also realized that the boxes were just too rough to stain as is. So I broke out the hand sander, and went to town. I started with a lower grit, and then finished with a higher grit for a smooth finish. It was difficult to get around all the staples, but I felt it was good enough. The box pictured here one of the other boxes. I decided to spray it antique white for a later project to be revealed. 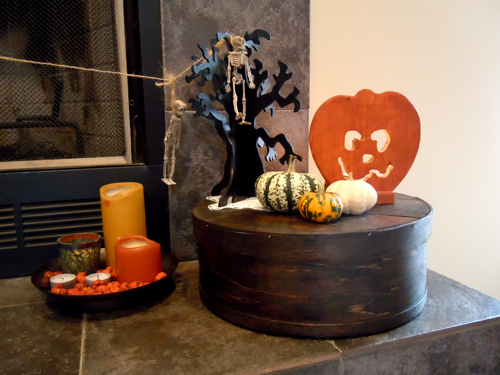 After wiping them down, I decided to try a different stain– Jacobean by Minwax. Much better! I applied it with a foam brush, and was quite generous. I then quickly, and lightly, rubbed it with a clean cloth. It looked beautiful after drying overnight, but I wanted a nice sheen so I finished it off with two coats of poly. I’ll try to remember to take some more pictures of it, later. See how you can see the grain of the balsa wood stand out? I really like the color this stain gives the box. 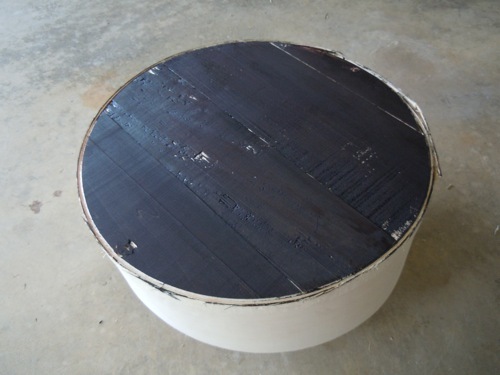 It’s also a great size- about 15″ in diameter. It’s just big enough to fit magazines and books into for a quick clean up.